Welcome to the KnightLites Events Page! This page highlights past KnightLites Outings and events. First hand accounts and photographs by participating Knights are welcomed and encouraged. See the story as only John Paul, AB4PP can tell it at the following link! 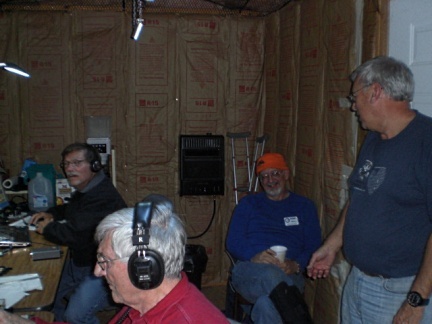 The ARCI Fall QSO Party (2010) photo gallery. Lots of "moxy" for such a tiny package. Sir Bob (AE4IC) in the foreground... 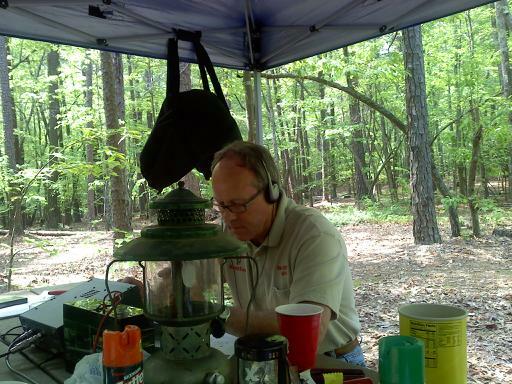 Enjoying a few rapid fire QSO's with some familiar compadres. 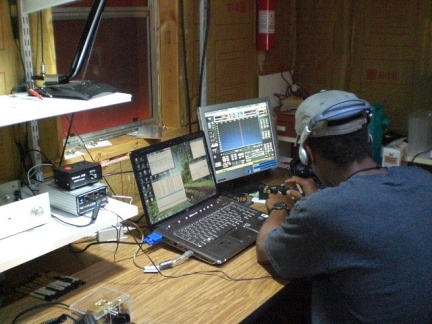 That's Sir Gary (N3GO) in deep concentration as he attempts to become one with Sir Paul's (AA4XX) new Flex-1500. Sir Mark (AJ4KZ) isn't being rude... nor should you perceive him as being shy. He's just engaged in some serious SDR interaction with Sir Paul's new Flex-1500. "Jilly! Come back, or I'm tellin' Grandpa! That was my dinner you just ate!!! 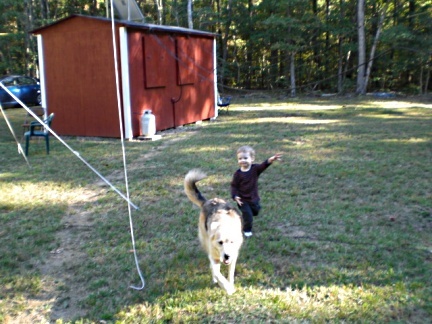 Master Noah, Sir Paul's (AA4XX) second harmonic, learning the loyalty boundaries of "man's best friend". Discussing dinner.. I mean contest strategy.. as the contest rages on in the Excalibur domicile behind them. 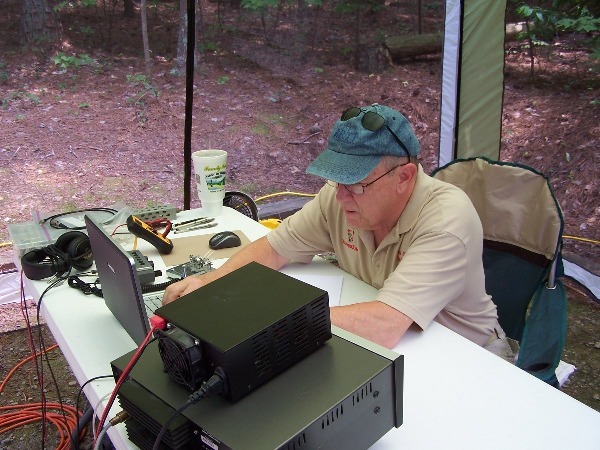 or missing out on the thrill of the hunt while observing Sir Bob's (AE4IC) skillful techniqes at logging all the good DX contacts.  while Sir John Paul (AB4PP) recounts past KnightLites operating escapades in the intricate and full color detail for which he has become legend. 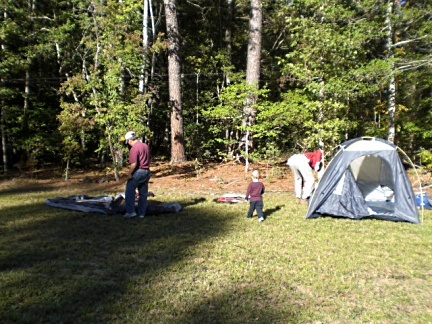 and Sir Bob (AE4IC) anchoring his final tie-down stake, compete in the tent raising contest. to Sir Gary's (N3GO) tearful cries of joy. Bob (AE4IC), Gary (N3GO), and "Lass" Jill (aka Jilly). The Mouth of the Excalibur's Dragon arachnid. sporting its 8 foot high suspended canopy of 23 radials, where the hungry beast is fed. The great sword Excalibur rises mid-field, and center stage, towering high above the shack that bears his name. The mouth of his "Dragon" looms subtle... perhaps clandestine in the foreground. 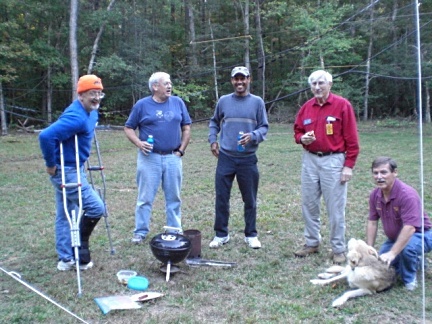 QRP ARCI Fall QSO Party 2010 at the site Excalibur October 16 - 17, 2010. It took weeks of meticulous planning, hours of careful preparation, tending to every detail, dotting every "i", crossing every "t", and taking virtually every precaution immaginable; to ensure we not only had a plan "B", but a plan "C" as well... and in several cases even a plan "D". We were prepared for any mis-step, barrier, hurdle, altercation, or otherwise unpredictable circumstance... well, mostly, anyway... At least we talked about it a lot. But the important point here is that we all arrived in time the have a great time... and that we did. 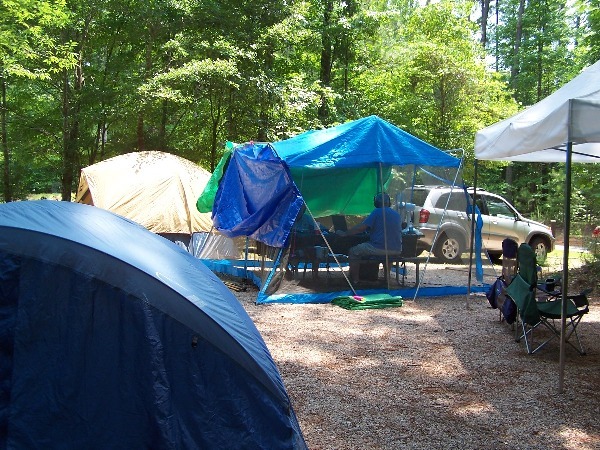 We converged early Saturday morning, at the site dubbed Excalibur. 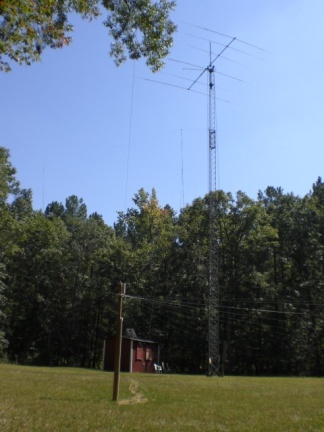 Located deep amid the forest in the kingdom of Sir Paul (AA4XX), Excalibur presides as the vortex of a half acre clearing, spanned by a canopy of wire antennae, criss-crossing at various elevations, in deliberate pseudo-random fashion; so as to achieve orthogonality when required to minimize interference. parallelism when required for gain enhancement and/or front to back rejection, and heck... just to keep them all from shorting each other out. What a mesmerizing masterful maze of meandering metal! Sir Paul's Flex-1500 had already passed muster, and was nestled in one end of the operating span and ready to pounce. Sir John Paul's (AB4PP) Sierra secured its claim in the number one operating position on the opposite end of the span. N3GO's Corsair jumped into the number two position for a brief stint, but was soon replaced with the more compact and managable K2 of Sir Bob (AE4IC), and we were off and running. The contest had only been going an hour or so by this time, so we knew we had plenty of time to catch up. While Sirs Bob, Marty (W4MY), and John Paul were operating, Sir Paul tended to the details of keeping the power resources to Excalibur running, patient and gracious hosting of the "K-team" which soon took on their new identity as the "Minute Men" once we discovered that we were going to be ready for just about anything... including working the contest itself... in a minute. Of course; the reasons for the minute delays were many, but we were a well disciplined team, and prepared in advance for just such circumstances, and took immediate action to mitigate the diversion by caucausing on which rigs work out most favorably in contests, whether or not the sidetone latency of the FLEX-1500 was a design flaw, or simply an artifact of our inability to ponder what we just sent while sending what's on our mind at the moment. Having discovered that those tactics were falling short of getting us back on track with the contest, we decided things might start showing signs of improvement if we had something to eat. 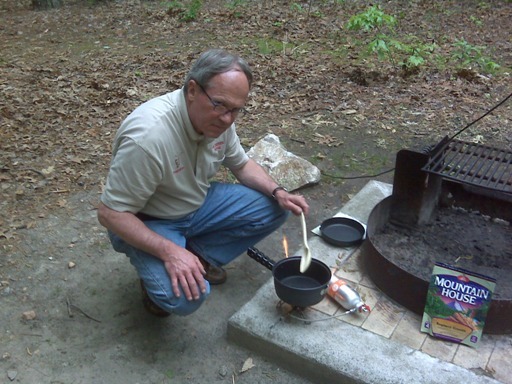 Sir JP (aka John Paul), always culinarily prepared for a batallion of starving Knights, fired up his portable QRP campfire, and began populating it with generous servings of bratwurst, Sir Marty's YL (Lady Kim), who was just leaving work for the day, was headed our way to visit Marty and meet the KnightLites gang. Sir Marty charmed her into stopping by Bojangles on the way to pick up a bucket of chicken for us. Sir Gary's (N3GO) XYL (Lady Marie), also stopped by with some sweet potato stew, so there was enough food to feed us all, and lots of food for thought left over.... and thinking and planning we did... finally; we got everything under control, and settled into an hour or so of some serious operating... maybe even longer. We were on a roll. Several of us took turns at the helm of Sir Paul's new FLEX-1500, groaned a few minutes each while learning the somewhat foreign user interface, and after finally learning how to navigate through its menus sufficiently well to work and log a contact, we all became smitten with some of its nifty features, and spent the bulk of our operating time with it surfing around checking out its bells and whistles. While operating, we couldn't help but take notice of each other's equipment.... Hmmmm... Let me say that another way... Excalibur's shack was also equipped with an enchanced feature WinKey interface that we all enjoyed diverting some of our attention to, and Sir Bob had fashioned a nifty and compact (12 V) power-supply distribution box to enable him to power all of his QRP equipment from a single Gel Cell battery source. It's a quite simple and elegant design, fashioned from a multi-port array of female RCA connectors, housed in a small protective box, that enables him to connect to and power as many as 8 devices instantly and simultaneously. 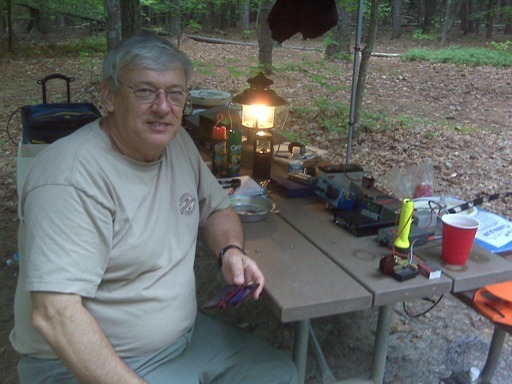 Watch our projects page for photos and details of this must-have QRP utensil. 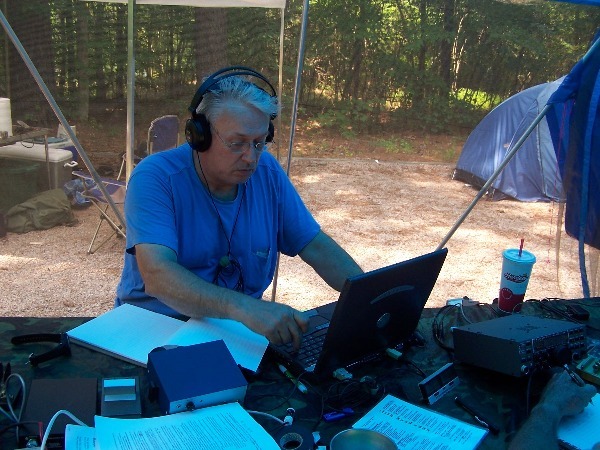 Relentless hours of aggressive contest procrastination ensued, and as the evening wore on, and the pursuit of callsigns not yet heard was losing steam, Sirs Paul and Gary began reminiscing about an evening spent at a star party searching for LF beacons. Soon we began demonstrating the art to Sirs Marty, and John Paul, and without breaking stride, we we all began tuning in to dig out and identify the beacons we were hearing. It was late... I mean really late... very very really late... ugh! Sir Bob had crashed by 11 PM, but the rest of us were too stubborn to to anything so sensible as that, and we were rapidly approaching 2 AM... then it happened... Sir JP was beginning to nod off... We could tell he was beginning to nod off... I think it was the snoring that gave it away. We all smiled at him with a compassion, and left him to slumber as we continued to copy more beacons. As Sir JP's snoring began to rise above the noise floor of the beacons, Sir Gary commented to Sirs Paul and Marty "watch this"... He then leaned over close to JP's ear, and said... "Are you asleep Sir John Paul?"... But instead of getting the expected non-response, Sir JP raised his head, and stated without hesitation... "No!... I'm copying beacons!... CLB!... zzzzzzzzzzzz". Ironically, he copied the beacon correctly... and wedged this entire exchange in between snores without any interruption in cadence. Now that level of copying skill is something we all can only dream about.... but wait! That is what Sir JP was doing... wasn't it? Around 2:30 AM or so, we were all feeling pretty drained and headed out to tent city.... Sir Gary reported he detected wildlife outside circling his tent and eventually decided to arm himself and step outside to chase it away, only to find Lady Jill (Sir Paul's faithful canine) standing at the entrance of his tent wagging her tail and looking cold. 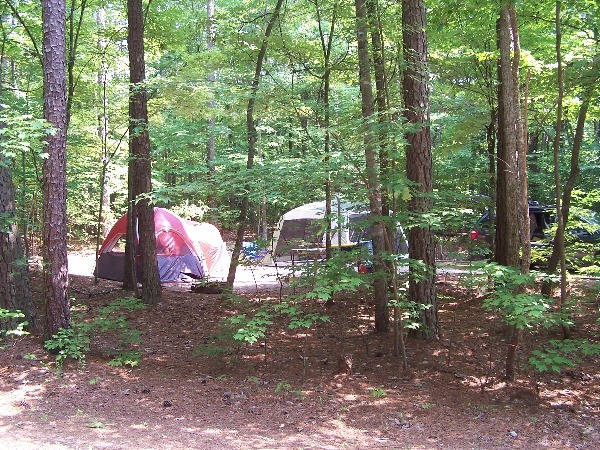 He invited her into his tent, where she finally settled in for a good (albeit short) night's sleep along her new and compassionate overnight companion. It was rough going for our host Sir Paul, but he was steadfast in his dedication to our comfort and entertainment. Our "mixed" reviews of his new FLEX-1500 radio weren't entirely complimentary, and although he was generally in agreement with them, critical comments are sometimes tough to hear. 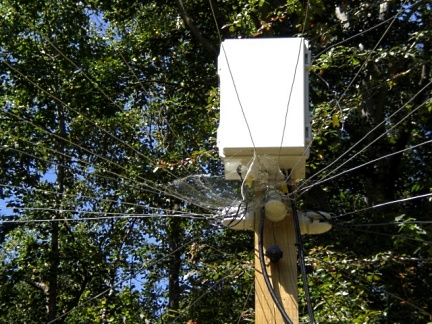 It was clear that he wanted and respected the honest integrity of the gang though, and in the end confirmed and acknowledged that our observations that the FLEX-1500 is not well suited for CW contesting mirrored his own, and shared that he was working on finding a solution to mitigate that attribute. To add insult to injury; Sir JP's snoring kept Sir Paul (who had pitched camp in his tent alongside JP) from getting any sleep. By 3 AM, he became restless, and headed to the house so he could get some sleep before starting a new day. 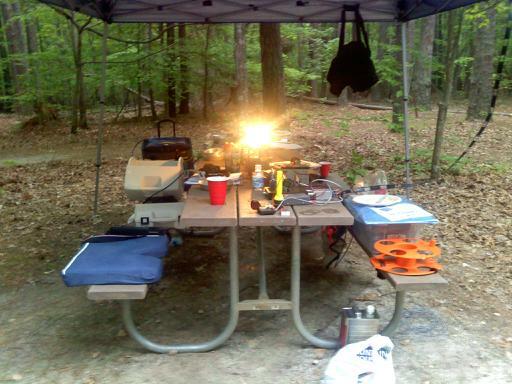 By 5 AM however; Sirs Bob, John Paul, and Gary had decided it was time to get started on the contest again, and were back in the shack firing up the furnace and turning on the rigs..... Oops! The FLEX radio needs a password to get started! Not allowing this to be a setback... remember what I said about all that extra planning.... well ! ! ! We tried all of the obvious password choices.... and trust me... there were many... but none of them worked... I won't disclose which of us made the suggestion, but a suggestion was made to call Sir Paul for the password. The alpha male of the group wasted no time, picked up his cellphone and began placing the call. Moments later, a small device lying on the shelf in front of us and about a foot or so away, began playing a happy tune... Aw #*^@... Sir Paul didn't take his phone with him! Ah ha! Plan "C" Let's call him at his house... Who has the phone number for his house?.... Not me.... Not me... Not me... ( Yeah! There were 3 of us, and none of us has his home number).... But wait! There's plan "D"... Let's use "his" cellphone, and call home... Bingo!.... Pay dirt!... Bullseye! That worked... and we woke up Sir Paul after he had just got settled into the REM phase of what was to be his recharge cycle before beginning the new day... He took it in stride though, gave us the password over the phone, and just a few moments joined us in the shack for another feverish day of contesting. As the sun began to warm up the team, and we were beginning to get into the contesting spirit again, Sir Mark (AJ4KZ) dropped by for a visit, and took a spin on Sir Paul's FLEX-1500 and helped beef up our final tally before the contest came to a close. We then all gathered and discussed our plans for the day while the bands began to fade into a soft gentle hiss of white noise and the contest was over. Wow! What a fun time... It was a tough challenge, intense, and exhausting, but we really racked up a score... of sorts I think... so we must have outdone ourselves once again. In addition to tours of the Excalibur's menagerie of antennae, we were invited to a tour of the castle of our host Sir Paul. We shared two slightly cool but otherwise awesome days in fellowship, and savored numerous dimensions of the shared passion that also happens to be our hobby. 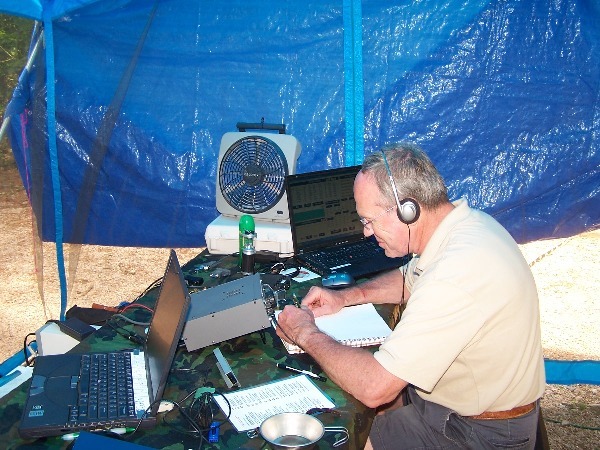 Sirs Paul and Bob strategized together on an Excalibur triplexer project to enable 3 operating positions to simultaneously share the beam without having to search for and swap antenna connections. 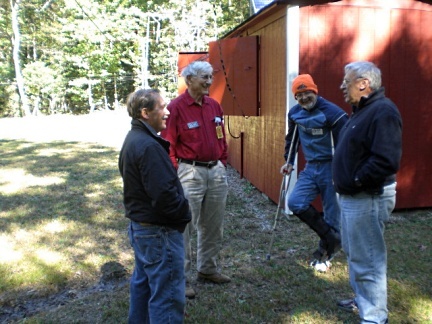 While Sirs Paul and Gary were discussing the Solar power system that charges the batteries that provides power to the site, Sir Paul described how he manually transfers the solar panel to one of 3 batteries on a daily basis to keep them all topped off. Sir Gary disclosed a project related to the charging application and offered to design a controller that would do the transfer task automatically and releave Sir Paul of the burden of doing so manually every day. It wasn't long, the contest was over, and the day was coming to an end. The minute men... each independently tired and happy... broke camp, waddled off to their respective vehicles, and departed upon a blissful journey home, and their own versions of normalcy that is their lives. Let me add to Marty's comments. I had more fun this weekend than for a long time. 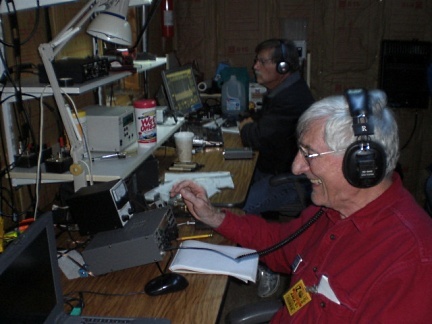 Not only was the company great, but I enjoyed hearing a lot of the old QRP regulars on the band. I don't know what we ran as a numerical score, but what ever it was, it was great! In addition, I'm dreaming about a new project -- (it could develop into a KnightLite project) So, thanks to all! I built a frame for the two 6' tables (that were too high during our operation). The height is now correct, so that won't be an issue next time. Table legs have been recessed to allow chairs to be pulled up anywhere along the 12' table length, so 3 side-by-side stations will fit very comfortably. I am building an audio interface to allow my external keyer sidetone to be injected into the Flex audio output, eliminating the CW latency issue. I wish I had of thought of this sooner, as it would have made the Flex a lot more fun to use. 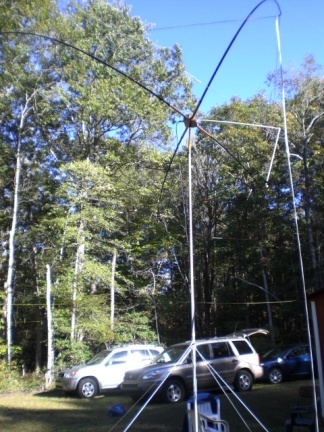 Sir Bob and I will be building W3NQN prototype bandpass filters as part of a 10-15-20M triplexer, which should allow us to run all three bands simultaneously with the TH6 yagi. Sir Bob is researching smaller toroids, since we are focusing on lower power levels than the original design by W3NQN. Sir Gary demonstrated a prototype of a PIC based battery charge sequencer at the recent KL Pigout, which will be perfect for keeping all three deep cycle marine batteries topped off via the solar panel. I have the PIC-IO board on order, and Sir Gary is programming a PIC for me. Thanks to everybody who suggested ways to improve the station. Jill and I look fwd to seeing you next time! Sir Derek WF4I in the kitchen!